Whew! We ran all over town - and other towns - for a year and I'm worn out. I think it's time to retire these photos and move onto something new. And his 1 year picture was snapped at nearly the exact time of his birth - 4:30 - at his first birthday party, wearing his custom 1 shirt! The stats for the month: 24 lbs, 8 oz (90th percentile), 31 inches (90th percentile), and his head measurement is 20 1/8 inches (still off the charts!). Hees ah beeg boii! 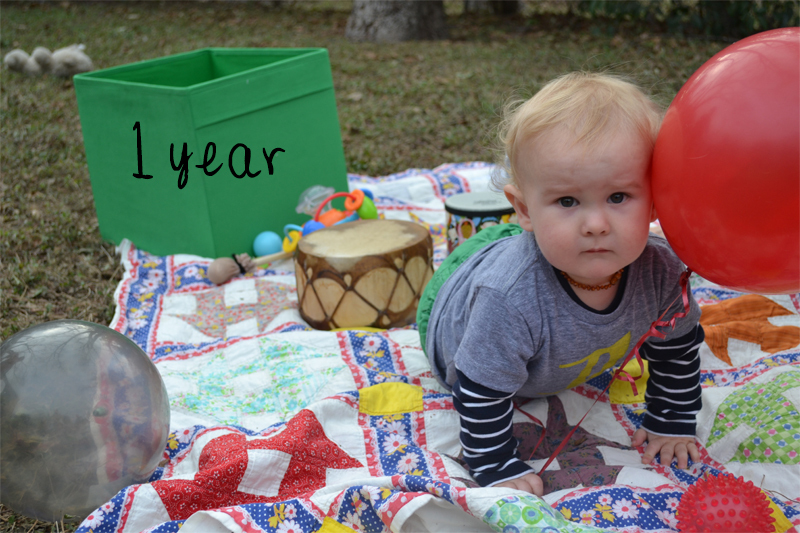 It seems like as soon as Eddy turned one, his talk turned into very conversational jibber jabber. He is trying earnestly to make the same sounds and words that we are making, working on his p, l, n, and f sounds to go with some of his favorite words: up, Lucy!, night night, on, and off. He has also surprised us all by saying words that sound an awful lot like Cookie, BonBon, Uncle Matt, Uncle Cory, and Grandpa. His favorite sign is still hot and he loves to tell us when lights are on and off. To outsiders it may sound like most of his sounds are the same but I can tell the difference between "aahbaa" for ball and "aahbaa" for balloon. On and off are also becoming more distinct as he puts very purposeful emphasis on the ending sounds. I've recently introduced the signs for help, hurt and book and he sure does study my hands. In the last few weeks he has also started shaking and nodding his head - powerful. His dance moves are definitely improving. He's added a head bob to his torso action and his very very favorite thing to dance to is the sound of Lucy. He will stop whatever he is doing no matter where he is in the house, look at us very seriously, and start dancing when he hears her drinking. He loves her rhythm. I've also caught him a handful of times getting the Led out in his car seat. So freakin' cute. He is now a total snacker, eating puffs, Booty, Os, raisins, dried cranberries, string cheese and clementines in between meals. And we now plan most of our dinners to include ingredients that he eats: turkey and sweet potato sloppy joes with kale chips (loved it! ), roasted veggies and parmesan (inhaled), breakfast tacos (duh), and spaghetti (Eddy Spagheddy!). He gets a major kick out of feeding Lucy and she doesn't protest. OH! And I forgot to add the stats about your teeth last night. You have TEN! 4 on top, 4 on the bottom and just as you turned one you started pushing through your first set of molars. Yowza! Unfortunately, the price you pay for spending most of the day standing is that sometimes you lose your balance. My poor child manages to get a new goose egg on his forehead just as the previous one has nearly faded. I think it's going to take a bit longer to find his balance enough to walk with this head he has. I can never be sure if he still has his trademark cheeks - I kiss them everyday so I don't know if they are thinning out. Just when I think that surely they're gone, a stranger in the grocery store will say, "Oh look at those CHEEKS!" Phew. Still got 'em. Alright - I feel like I've definitely forgotten a million things. Bottom line: Eddy is growing up. He is smart, he is quick, he is funny, he's a good dancer. He is awesome. a year old, you already answered my question- love the way you tracked each month! So sweet, what a cutie!